Previously we mentioned about Viewsonic’s ViewPad 100 dual boot 10-inch tablet PC with Android and Windows OS dual-boot OS, now more details have been announced during IFA event held in Berlin recently. 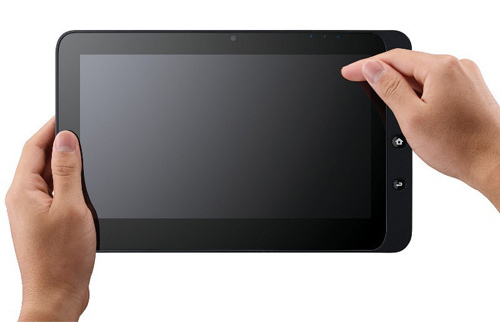 Named as ViewPad 100, the device is powered by Intel Atom processor clocking at 1.66GHz supporting both Windows 7 and Android version 1.6 to compete against Apple’s famous iPad and other tablet PCs in the market. ViewPad is designed with a 10-inch multi-touch display featuring 1024 x 600 resolutions which is common specification for nettops and netbooks. Internally, it has an integrated SSD device that provides 16GB storage capacity, and at the same time, there is additional SDHC card slot for memory expansion, providing greater flexibility as compared to iPad design. Besides, it utilizes 1GB DDR3 memory that can definitely enhance overall system performance. Other features include necessary wireless technologies such as Bluetooth, Wi-Fi and GPS to make it an all-in-one portable mobile companion for all users. Not to be lacked behind when comparing to netbook market, it features a built-in 1.3MP webcam, two USB host ports as well as VGA video output suitable for those that would like to treat it as conventional PC usage. Targeted to be available in October 2010 for Europe market, the device will be retailed at £549 (equivalent to $848) which is quite pricey for average users. However, no confirmation on when will it be available to US market yet but it shouldn’t be too late as long as there is demand for dual boot tablet PC.